Question 1: Tell me about you. I want to know what made you interested in working in this specific line of work. Tell me your story. My oldest of four siblings, Tim, has severe developmental disabilities. I think you could say that it’s severe autism, although when he was diagnosed I don’t think they were using that term. The doctors were using terms like “mental retardation” as well as “schizophrenia” – and he may, in fact, have schizophrenia. I’ve been in law practice since 1979, 39 years, and I would say for the first 10 years of my practice, I was not in this field. But as I got more and more involved in Tim’s life and his community, I would meet other family members, and they would ask me questions about guardianship and about special needs planning, and I just started to learn more and more about it and slowly got involved in it and then it grew into a full-time practice, which it has been for over 20 years. Question 2: Talk to our readers, and tell us what you do on a day-to-day basis. For probably about a third of every day, I help clients, whose children are turning 18 who have intellectual and developmental disabilities, obtain guardianship. The reason for this is that parents lose their parental rights over their children when their children turn 18, and when their children have intellectual and developmental disabilities – or “incapacity” is really the word that the law uses – they need someone to be their guardian. It’s almost always their parents, but occasionally, it is a grandparent, other relative or caregiver. When parents obtain guardianship over their child, it essentially restores the rights, powers and authority that they had when their child was a minor. And we typically try to accomplish this when the children are turning 18. We begin a few months before their 18th birthday and we try to wrap up right around the time of their 18th birthday, but it’s not uncommon for clients to come to me when their child is 19 or 20 or even later. Prior to age 18, parents are the natural guardians of their minor children. I spend about another third of my day working on special needs planning, which is drafting documents in the estate planning context for families who have a special needs child, whether adult or minor. We start with the premise that everyone should have an estate plan – and an estate plan means, typically, a will for the mother and a will for the father, and then an assortment of short, standard documents that everyone should have that deal with our own potential incapacity, such as powers of attorney. Usually we create a separate document called a special needs trust agreement, which creates the special needs trust for the special needs child. It becomes funded and operational when the last parent dies through that parent’s will and, perhaps, through some life insurance, IRAs and annuities. One is that a special needs child is typically going to be receiving disability benefits that are means-tested, such as SSI, Medicaid and Medicaid waiver benefits. A person cannot qualify for those benefits if they have assets worth more than $2,000. Another reason for special needs trusts is that people who have developmental disabilities frequently do not have the ability to manage their inheritance. They wouldn’t have the ability to invest it, to place the inheritance in the proper bank accounts or investment accounts, and often they would be susceptible to exploitation or theft or mismanagement. The trust also provides that type of protection through the proper management of the inheritance. A third reason for a special needs trust is the avoidance of guardianship of the estate. I mentioned guardianship earlier, and I should have said that I was talking about guardianship of the person, where the guardian has the right and the authority to make decisions regarding personal matters for that person with the incapacity. 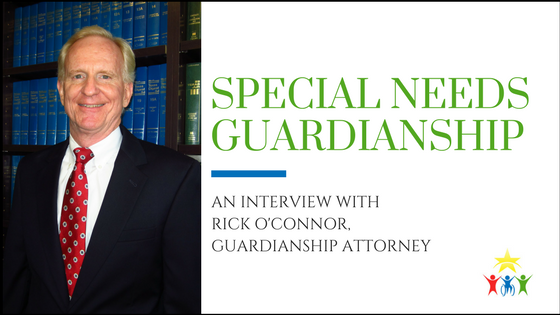 Guardianship of the person is what is common because the person with the intellectual and developmental disabilities typically does not have an estate. We try to avoid guardianship of the estate and we do in almost every case, and that’s a good thing because it avoids a lot of accounting, reporting, the guardian being bonded and other requirements. Avoiding guardianship of the estate is a worthy goal, and that is one of the purposes of a special needs trust. It allows the private management and administration of assets that are for the benefit of a person with a disability. And it’s typically done using the court system, but in Texas, when someone has a will, it’s relatively simple, and it’s quite ministerial. Probate would also include settling the estate of someone who has died without a will but that can be a lot more involved, and there’s a lot more court oversight and a greater obligation to account to the court for the proper settlement of the estate. I help families who have a deceased family member administer that person’s estate, which typically means paying the debts, selling any assets that need to be sold – sometimes it’s a car or house or stocks or whatever – and then distributing the proceeds and remaining assets according to the will and according to the law if there is no will. So, that’s probate. Conventional estate planning would involve preparing wills and trusts and powers of attorney and so forth for typical families, families that don’t have a special needs child. Question 3: I hear that you’re one of the less expensive lawyers to go with for something like this. I hear you charge about $700 to do the guardianship process. So, why is that? One way that I’m able to do it is that I have, what I call, a group process, which I will explain: It really is just that when I set my cases for hearing, I set three, four or five in the same court, on the same morning or the same afternoon, and that helps me pick up efficiencies, allowing me to keep my fee down. Another reason I keep my fee low is that I just want people to have access to this kind of legal service, and I encounter a lot of people who can’t afford it or for whom it is a real financial strain. I’m able to keep my fee down partly because my assistant and my law student intern are able to do a lot of the basic work so that I can focus my time on the tasks that require an attorney, such as attending the hearings. Question 4: Can you tell me the differences between guardianship, powers of attorney and supported decision-making agreement? Guardianship is a court process, which concludes in a hearing in front of a judge. The hearings tend to be relatively informal and short; nevertheless, there’s a whole system of due process, steps leading up to that hearing, making the process at least eight to 10 weeks in duration, and sometimes three to four months or more in duration. A power of attorney, on the other hand, is simply a document, and there are actually two of them: One is for medical matters, and one is for financial matters. There is no court system, no court process, no due process – you can get the documents from an attorney or, if you’re really resourceful and careful, you can even get them online (although I don’t recommend that). In the documents, you designate and appoint someone to be your agent to make decisions for you and handle your affairs. So, some of my clients say, “Well, why can’t I just get that instead of guardianship?” and I totally agree that it’s more appealing and simpler than guardianship. A power of attorney doesn’t take away a person’s own right or ability to make decisions. So, if the person is away from his agent, he can make decisions on his own. He is able to get married or consent to a medical procedure or buy a car or enter into any other kind of contract, even though there’s a power of attorney. Now if they were under guardianship, the guardian could go back and undo whatever that person tried to do. For example, a marriage could be deemed void or a contract could be avoided if the person is under guardianship. For a parent who wants to be able to have maximum ability to be able to make decisions for their incapacitated child, guardianship is the best option, and it is the most common and the most typical, and the other options all have clouds over them, in my opinion. Supported decision-making agreements are sometimes entered into connection with powers of attorney. The supported decision-making agreement is a new device in the statute. In my opinion, it is quite a vague form agreement, easily ignored and difficult to enforce. You can contact Rick by dialing this number, 214-691-3400, or by clicking the button below. We couldn’t do what we do without the support and donations from people like you who care. To keep our organization open and thriving, please consider donating to our cause. Click the button below to give us donation. Hello. I’m looking for help with guardianship. We reside in Hudson county. My son is on the autism spectrum and will be 18 in November. It’s very informative when you said that the special power of attorney can help the child appoints someone to make decisions for him/her. My friend has a child with special needs and she often travels because of work. I’ll advise her to get a special education lawyer just in case something will happen in her absence, she’s sure that her son will be in good hands.